Performance materials, score and parts, are currently available for the first movement only. This is the last of Ludolf Nielsen's three symphonies, of which only the 2nd was published in his lifetime. 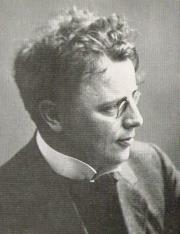 The 3rd received several performances in the first ten years after its completion in 1913, after which there were several more performances (still only within Denmark) using an edited and shortened version of the score by Ludolf's pupil Launy Grondahl. A motto is attached to the original score, a quote from poet Viggo Stuckenberg, which gives a theme to the symphony. This first movement is a virtual tone-poem all by itself, full and satisfying from beginning to end, as epitomized by the motto poem fragment "...Know joy requires a stormy night". The movement was played by itself on the occasions of Ludolf's 60th birthday and on his death, though in both cases the edited-down versions by his pupil Launy Grondahl were used. Until 2012, the symphony had not in any form been played in public outside of Denmark. It was recorded in its full original unedited form by the Bamberg Symphony under Frank Cramer as a studio recording in 1999. The first movement by itself was publically premiered (outside of Denmark) at a concert in November 2012 by a community orchestra in San Jose, California, the South Bay Philharmonic, George Yefchak conducting, utilizing a draft of the new published edition by Harmonic Services Group. The movement opens very quietly, slowly adding instruments, and builds to an early magnificent climax, as if depicting the celebration of a new day, the sun slowly rising until it bursts full and majestic. But along the way there are doubts and hints of storm to come. Measure by measure the intensity of the themes build, and play out against each other. Although there are a few moments of repose within, in general the storm continues to build and whips up powerful emotions. Finally, as the coda of the movement is reached, the storm is conquered and we conclude in grand resolution, "knowing joy" in full. 4. Andante lento; allegro maestoso, etc.